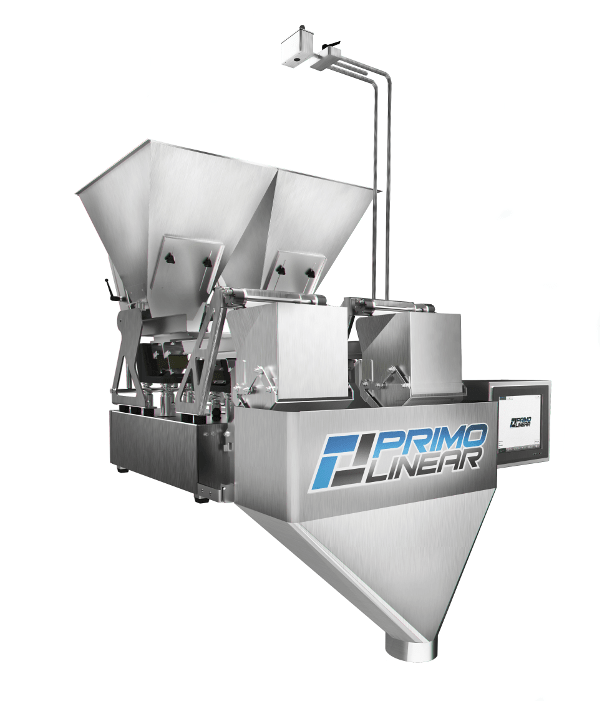 The PrimoLinear™ family of automatic weigh filling solutions are designed for weighing and dispensing of a wide variety of products including but not limited to beans, rice, poultry, snack food, confections, fresh produce, spices, coffee, pet food, frozen foods, chemicals, hardware and more. The PrimoLinear™ is available in several models and is designed for weight dispenses between 2 grams and 50 lb with filling rates up to 50 cycles per minute. Its leading edge PC controls can be precisely configured to your specific product flow, speed and accuracy requirements. All designs include stainless steel open frame construction, tool-less removable contact parts and more. The PrimoLinear™ V-mini automatic weigh filler is ideal for accurately dispensing ingredients and small weighments. Very accurate, it can dispense weights as small as one gram and reads in 1/100th of gram increments. Typical applications include nuts, dried fruits, seasonings, confections, chocolate, spices, herbs diced meats, cheese and pharmaceuticals. The PrimoLinear™ V5 automatic weigh filling machine is designed to accurately dispense and fill a wide range of products into bags, cartons, trays, boxes, jars and containers. The PrimoLinear will accurately weigh, dispense and package nuts, snack foods, candy, hardware, frozen foods, vegetables, fruits, meat, poultry, ingredients, spices, coffee, powders, granules, pet food and much more. Designed for long term use and dependability the PrimoLinear includes a stainless steel frame, tool-less tilting hopper that requires no change-over when running multiple applications; tool-less removable contact parts, and standardized components that reduce maintenance costs. Automatically fill cases and totes with the V and T series bulk filling machine. The robust V (vibratory) and T (tote filling) 25 model automatic weigh filling machines are engineered for large format filling applications. From 5 lbs to 50 lbs, the PrimoLinear is perfect for wholesale, institutional and food service requirements. Common packaging applications include weigh filling chocolates, candy, frozen foods, vegetables, fruits, baked goods, snack foods, ingredients, chemicals and much more. Specifically engineered for weigh filling sticky, damp, wet and difficult to move products as well as delicate product requiring the gentle handling. 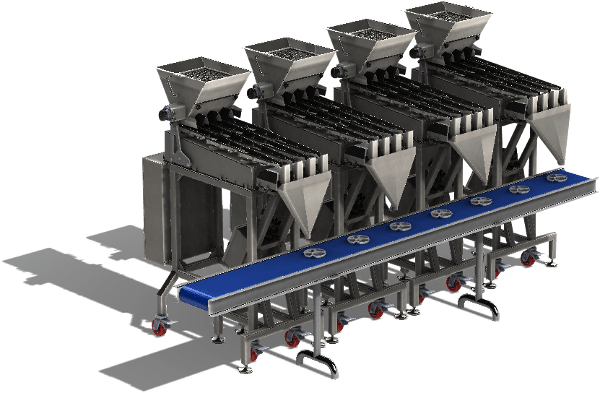 The PrimoLinear C and IW Series weigh filling machines use conveyor belts as opposed to traditional vibratory feed pans to carry product to the weighing station. 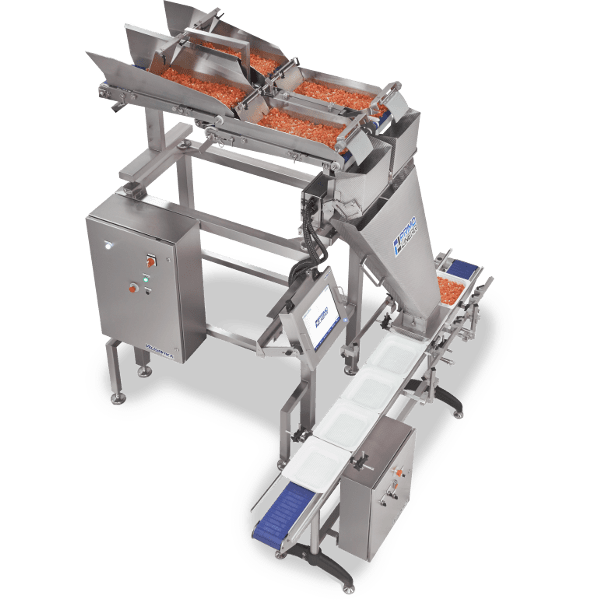 Commonly used fresh cut fruits and vegetables, shredded cheese, fresh meat, poultry and seafood, standard features include stainless steel frame, easily removable conveyor belts, large color touch screen, PC controls, production reporting and online support.